I was visiting Disney World with my family when I happened upon the Divvies treats. My son, who has a severe Nut allergy was so excited that he found chocolate chip cookies and caramel corn that he could eat. We bought one of each and went on our merry way. Walking around the park we all started to enjoy his treats; so much so, that upon exiting the park we bought several packages of each so that we could safely enjoy the rest of our vacation. 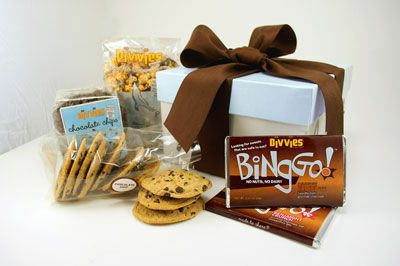 When we got home, we got online at www.divvies.com and purchased boxes of the Divvies doubles and other pop corns available. We were excited to see the Cupcakes, Cookies, Popcorns and Candies that are available to ship directly to our home. We also found the product to be available in some Whole Foods locations. If you are a family travelling with Food Allergies make sure to visit Divvies online and have the treats sent to you before you leave. Knowing that Spencer is now able to enjoy treats on vacation has been the best and easiest way for us to travel.